Announcement Beautiful jewellery handmade in my Hackney studio, I am happy to work to commission and have a lovely selection of gems to choose from. Please feel free to get in touch to discuss what you want, I am always happy to chat about jewellery! Beautiful jewellery handmade in my Hackney studio, I am happy to work to commission and have a lovely selection of gems to choose from. Please feel free to get in touch to discuss what you want, I am always happy to chat about jewellery! 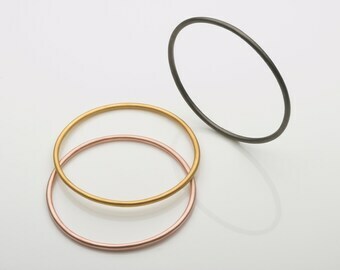 Bangle set, three bangles in yellow gold plate, rose gold plate and black rhodium platae. I absolutely love this ring - thank you so much for creating this lovely piece Naomi. Naomi was a pleasure to deal with from the moment I bought this ring right till the end including sale after care. I strongly recommend Naomi and her creations, I surely will be returning to buy or commission additional pieces of jewellery. I look forward to wearing my lovely ring everyday it makes me feel so happy wearing it. A very smooth communication and fast delivery. Very satisfied with this purchase, this jewel became the perfect Christmas gift for my girlfriend. 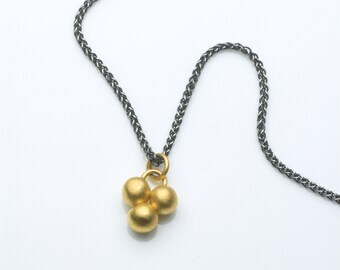 The length of the chain is perfect. The refined gold leaf motif on this necklace makes this jewel special for us because we both love walks in nature, often through the rustling leaves. Thank you for your craftsmanship .... and the possibility of attaching a personal message for my girlfriend. Great service! A pendant for mum? I have some lovey ones to choose from. 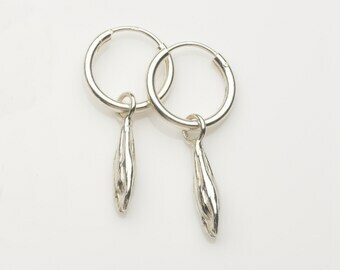 Looking for Mother’s Day gifts, how about a pair of earrings? I have these and plenty more in my shop. Soldering station ready for action. Working on one of my three band rings. 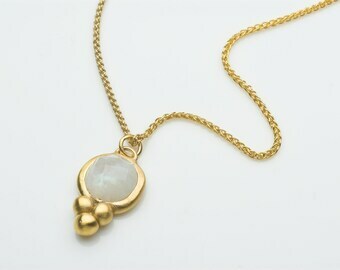 Elegant and understated jewellery that is simple and beautiful to wear. 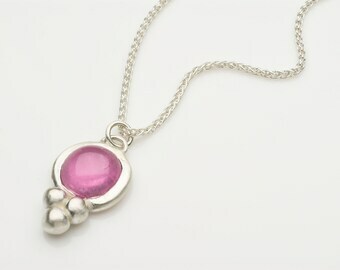 Having had a lifelong affinity for jewellery, I discovered my passion for jewellery making later in life. Originally studying fine art and photography (both disciplines which have influenced my work) I took a taster course in jewellery making and soon realised that I had discovered my true calling! I studied for a City and Guilds in jewellery making, and after some time off to start a family I set up this shop to start selling my work. I enjoy experimenting with contrasts, mixing silver and gold, satin and polished finishes and different textures on metal. I work mainly in silver, gold and semi-precious gems and use traditional metal working techniques such as piercing, wax carving and Kuem Boo (the ancient Korean art of fusing 24 carat gold foil) as well as working with modern materials such as acrylics and epoxy resins. 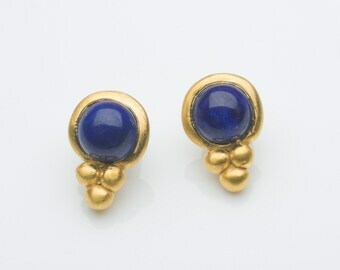 I am very influenced by the jewellery of the ancient world as well as the natural world around me. 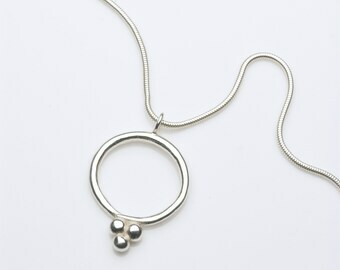 In all my work I strive for simplicity, paring down line and form to create elegant and understated jewellery that is simple and beautiful to wear. Clarity of design and the best possible execution are my key goals. My hope is that the pieces will enhance the way you look, rather than draw attention to themselves. It gives me a great pleasure to see that many of the people who bought a piece, return for more. Follow me on Facebook to see more of my work, new designs in the making as well as the odd cat photo! I have always loved jewellery, first buying and wearing it and after taking evening classes (and later a City and Guilds) I discovered that I also love making it! I take all my stone setting to a workshop in the heart of Hatton Garden with experienced staff and a high standard of work. All my gold plating is done in a well established polishers and platers based in Hatton Garden. All my casting work is done at a professional casters based in Hatton Garden, they cast from masters, make moulds and I do all the finishing myself back in my studio. If you find that you are not fully satisfied with the item you purchased, I will accept return of the item in an unworn and undamaged state within 14 days of you receiving the piece, per Consumer Contract Rules and Regulations 2014 (excluding custom pieces and commissions). Items must be as new and in their original packaging. Return postage will be at the expense of the buyer. If you are returning an item, please do so by return Special Delivery Registered Post in the UK or another insured carrier if overseas to protect yourself from loss in the event that returned items are lost or damaged in the post. I will not be liable for items lost in the post. Refunds will be made via the same means you paid for the piece. Commissions are returnable only if faulty and will be for credit only. Refunds will not be provided for damaged, worn, dirty or incomplete items. Pierced earrings cannot be returned for hygiene reasons, other than where faulty. I am happy to accept credit cards, debit cards, PayPal and Etsy gift cards all through the Paypal account. If your order is already made and in stock I will ship it once payment is received within the advertised timescale, if the item needs to be made I will contact you to discuss the timescale for the piece and give an expected dispatch date. Most commissions/ custom made pieces will require a 50% deposit before work begins and balance to be settled before shipping of the completed piece. If you wish to cancel the commission/ custom order you must do so before work has begun, if work has started the cancellation fee will be the equivalent of the 50% deposit. Packages posted within the UK will be sent by Special Delivery Registered post and will arrive by 1pm the day after postage. International shipping will be sent using Royal Mails International Tracking and Signature services, Tracked & Signed is a combination service offering full end-to-end tracking, signature on delivery and an online delivery confirmation and delivery will be in up to 10 working days. Any Customs or VAT charges are the responsibility of the customer. I am not liable for items lost or damaged in the mail. •	We will retain your personal information only for as long as necessary to provide you with our services and as described in this Privacy Notice. However, we may also be required to retain this information to comply with our legal and regulatory obligations, to resolve disputes, and to enforce our agreements. •	Change, restrict, delete. You may also have rights to require us to change, restrict our use of, or delete your personal information. Absent exceptional circumstances (for example where we are required to store data for legal reasons) we will generally delete your personal information upon request. •	Object. You can object to (i) our processing of some of your information based on our legitimate interests and (ii) receiving marketing messages from us after providing your express consent to receive them. In such cases, we will delete your personal information unless we have legitimate grounds to continue using that information or if it is needed for legal reasons. if you have any questions, concerns, wish to complain or exercise any of your rights, you may contact me at info [!at] naomitracz.com or by post to The Managing Director Nami Tracz Limited, First Floor Healthaid House, Marlborough Hill, Harrow, Middlesex, HA1 1UD.